Burberry Prorsum’s latest Fall Winter 2013 menswear shown in Milan just yesterday was all about seeing classics with a new eye. Evolving the brand’s outerwear and updating them with new colours, materials and shapes, while injecting playful elements, was the intention of creative director Christopher Bailey. Befittingly, the collection was called I Heart Classics, as explained by the designer. 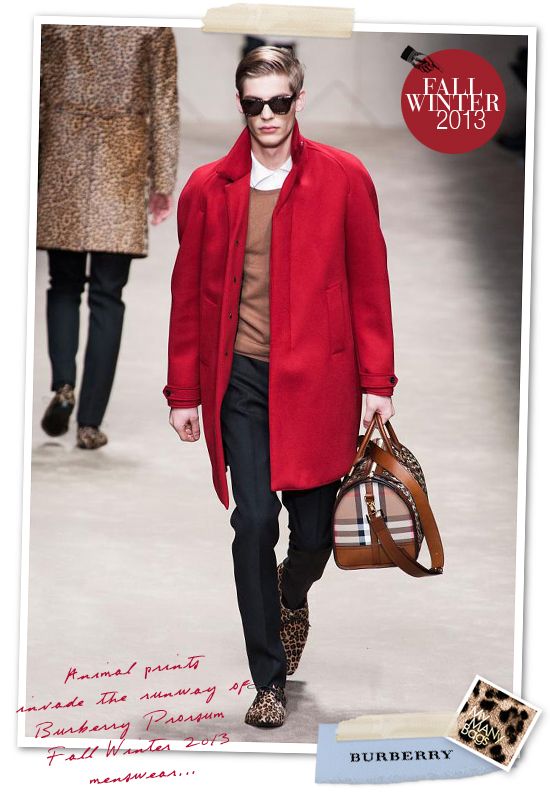 There are cheeky hearts, resembling text message symbols (Burberry has always propagate the technology driven modern age), translucent rubber topcoats in burgundy, grape and caramel... but most memorable of all, abundant animal prints that will trek the Burberry man into the jungle (or urban jungle) by next winter. 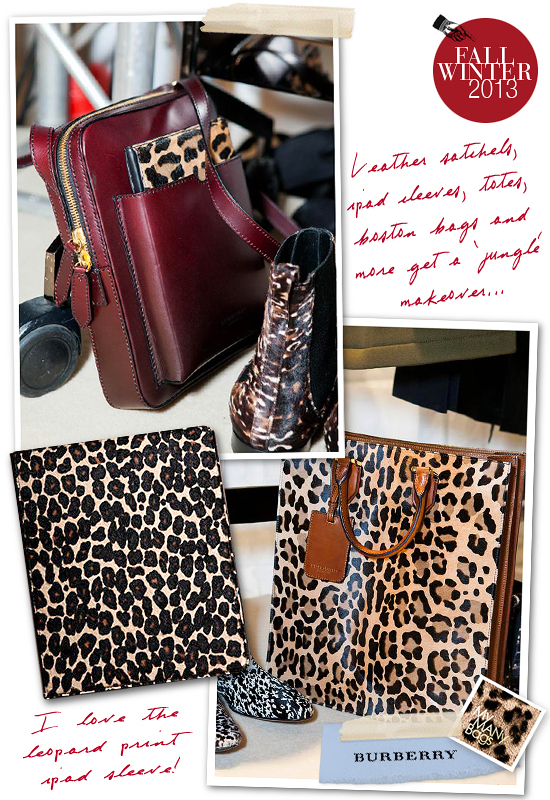 Look forward to accents or full on splashes of animal prints on collars, shoes, Boston bags, totes and leather satchel bags that deserves some 'wild' attention. So what are your thoughts on this latest Burberry Prorsum menswear offering? Too kitsch? Too boring? Or you simply love it for the fun but highly wearable aspect of the collection. For me, it is undeniably a safe collection, nothing overtly surprising but all mixed and combined together with the savvy eyes of a seasoned designer. On a last note, you can pre-order the bags and outerwear and wear them way ahead of everyone at www.burberry.com till 20 January. I am thinking about the small leather satchel with contrasting Burberry checks and leopard printed pocket (USD1195 or SGD1995). Should I? 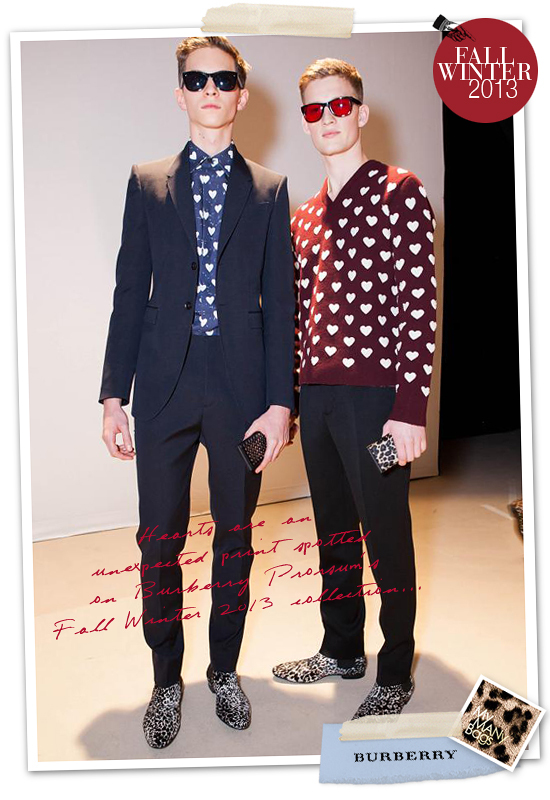 More pics of Burberry Prorsum's Fall Winter 2013 Menswear collection (including backstage pics) on my facebook fanpage. 'LIKE' my fanpage if you enjoy reading this post.